Corinne Kisner is an urban planner dedicated to building safe, sustainable transportation systems and equitable, active cities through better street design and transportation policy. As Executive Director of NACTO, Corinne oversees the organization’s national programs and publications, manages an incredible team of NACTO staff, and liaises with a network of leading city transportation officials to advance people-oriented urban design. Over six years, Corinne supported NACTO’s growth from two dozen to over 70 active, engaged member cities and transit agencies. She has worked to communicate a new vision for urban transportation, serving as lead editor or author for many of NACTO’s foundational design guides. Corinne led the development of the NACTO Designing Cities conference, which under her leadership has grown from a niche gathering to what is today one of the premier city transportation conferences in North America. Most recently, Corinne launched Leadership NACTO, which is cultivating the next generation of city transportation leaders. 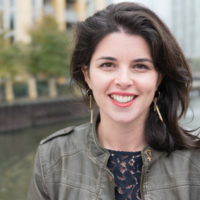 Prior to joining NACTO, Corinne held a Mayoral Fellowship at the City of Chicago, as well as positions at the Clean Energy Coalition, the National League of Cities, and the Climate Institute. Corinne has a Master’s of Urban Planning from the University of Michigan and a Bachelor of Science in Foreign Service from Georgetown University.